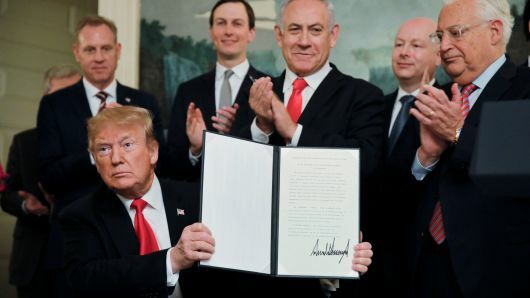 US President Donald Trump’s official recognition of Israeli sovereignty over the occupied Golan Heights has provoked various reactions from strong statements refusing to accept it through to despondency about the decision. This is not the first provocative decision of this administration in the region and it is unlikely to be the last. Previous decisions around moving the US Embassy to formally recognize Jerusalem as Israel’s capital were also met with strong criticism and opposition. Practically, though, the US is clearly imposing a new reality on the situation which places the markers for future talks and negotiations. If the political pundits are correct and Israeli Prime Minister Netanyahu is successful in winning another term in the upcoming elections, we are likely to see further measures under the same strategy to set new conditions for any future settlement negotiations. Post-election may see more serious moves such as annexation of the West Bank, or parts of it, as Israel changes the pieces on the board creating a new reality for key parties to consider the implications, and creates a new starting point for negotiations. These moves so far have been calculated to shift the existing reality without any practical impact or serious pressure on the US or Israel. So, while some may have concerns around issues such as the Hashemite custodianship over the holy sites in Jerusalem, there are more serious direct threats on Jordan such as the potential annexation of West Bank to Israel, given the deep geographic and demographic connections. This makes it even more important for Jordan to develop a strategy based on the reality of the situation and its key priorities. In order to be effective in managing the coming changes, Jordan must find quick and effective solutions to its internal economic and political issues. Jordan needs to be stable, self-sufficient and united if it is to navigate regional developments to its advantage. The alternative is to be a passenger, and have others dictate its future. The Americans may have managed to take these provocative decisions because of a lack of real capacity to oppose them, but it also demonstrates a clear desire to find regional settlement. Each move is clearly designed to include key players. The first was to bring the Palestinians to the table, and this move is to bring the Syrians to the table and put pressure on Moscow to mediate this step. Responding to these moves with condemnation and opposition is unlikely to achieve anything other than provoke a similar response that negatively impacts Jordan in order bring them to the table as well. More practical engagement is key, as the current opportunity to change conditions will not be available in the future. It is interesting to see that Pope Francis and the King of Morocco recently called for Jerusalem as a symbol for the global peace. They highlighted that Jerusalem represents the common originator of humanity, or at least for the followers of the Abrahamic religions. It is a shared city and could be a symbol of peaceful coexistence, where mutual respect and dialog can be cultivated.